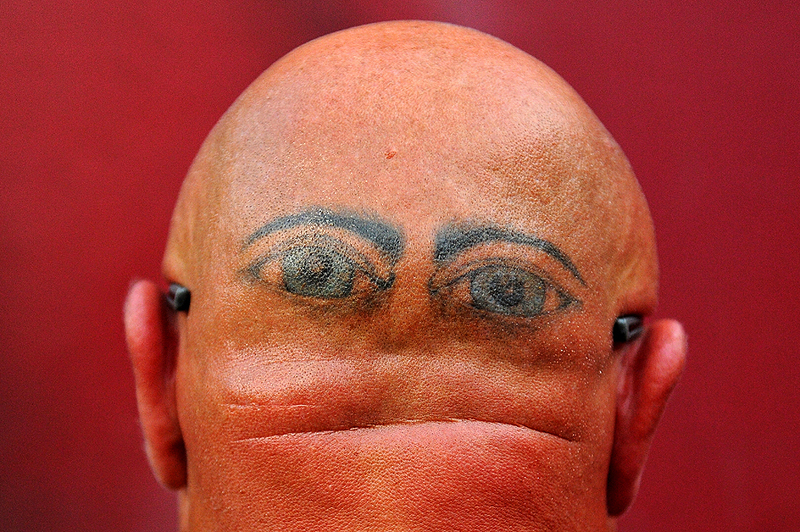 "Larry Mooney poses for a portrait displaying his eyes in the back of his head tattoo during a preseason NFL game at FedExField on August 7, 2014 in Landover, Maryland." Sports can be a difficult thing to document visually - one can miss the big play, a career-ending injury or even a momentous play if not paying attention. But there is more to the action on the field. The sidelines and behind the scenes of the players are filled with compelling moments, too. Yet the spontaneity of a sporting event sideline is magical sometimes when looking away from the superstars. As I made my way onto the field during a preseason NFL game in Washington, DC, I turned around because I saw a pair of eyes looking at me. When I made eye contact, I realized it was simply a tattoo. It was too eye catching to pass up. The more I look at this, the more I see within the picture, like the wrinkle in his head that looks like a mouth. I am wondering though what this employee can see behind him. I could have sworn I sat behind this guy on Opening Day at Camden Yards in 2010. Looked at my pics, and turns out that guy only had one eye on the back of his head. Let me tell you, it stared at me the whole time.